•	Load ranges from 30kg up to 700kg per wheel. Black rubber tyre on black polypropylene centre with a plain bearing. Wheel diameter 80mm, Tread width 25mm, bore size 12mm, hub length 40mm, load capacity 50kg. Black rubber tyre on black polypropylene centre with a roller bearing. 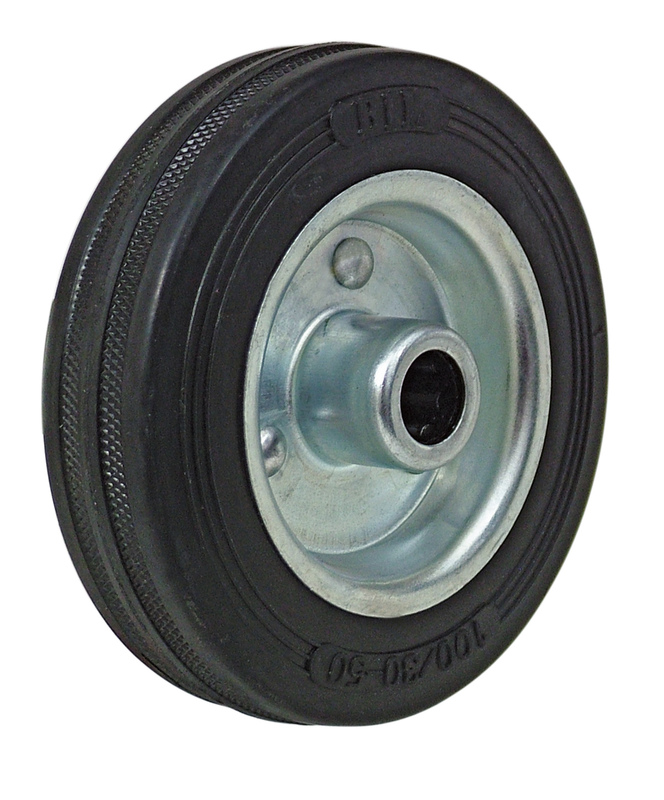 Wheel diameter 80mm, Tread width 25mm, bore size 12mm, hub length 40mm, load capacity 50kg. Black tyre black polypropylene centre with a plain bearing. Wheel diameter 100mm, tread width 30mm, bore size 12mm, hub width 40mm. Load capacity 70kg. Black tyre black polypropylene centre with a roller bearing. Wheel diameter 100mm, tread width 30mm, bore size 12mm, hub width 40mm. Load capacity 70kg. Black rubber tyre on steel disc centre with a roller bearing. Diameter 80mm, tread width 25mm, bore size 12mm, hub length 40mm. Load capacity 50kg. 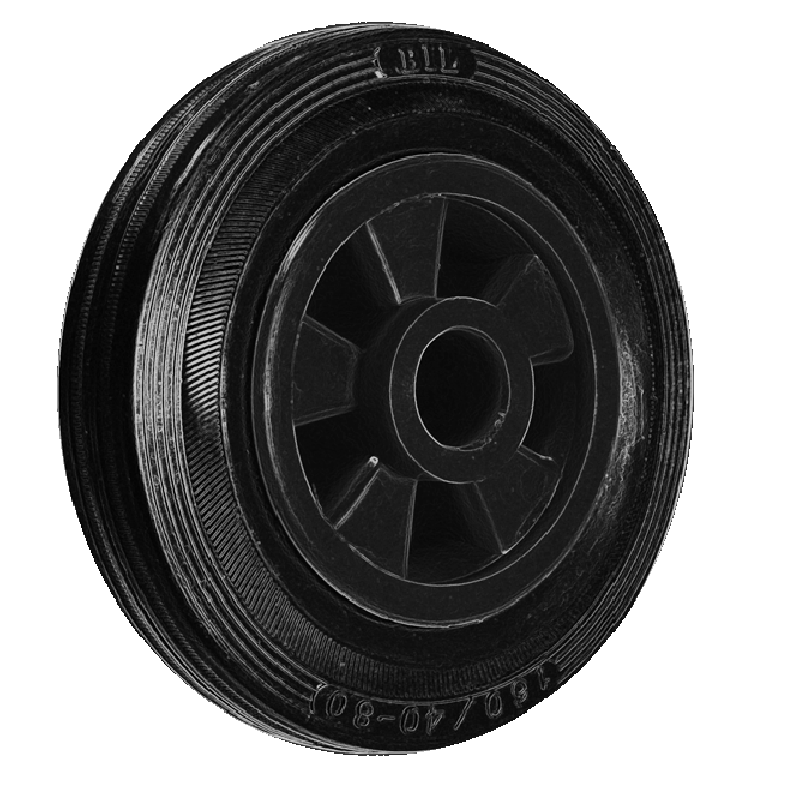 Black tyre black polypropylene centre with a plain bearing. Wheel diameter 125mm, tread width 37.5mm, bore size 12mm, hub width 40mm. Load capacity 90kg. Black solid rubber tyre on polypropylene centre with a roller bearing. Diameter 125mm, tread width 37.5mm, bore size 15mm, hub length 45mm. Load capacity 90kg. Black rubber tyre on steel disc centre with a roller bearing. Diameter 100mm, tread width 30mm, bore size 12mm, hub length 40mm. Load capacity 70kg. 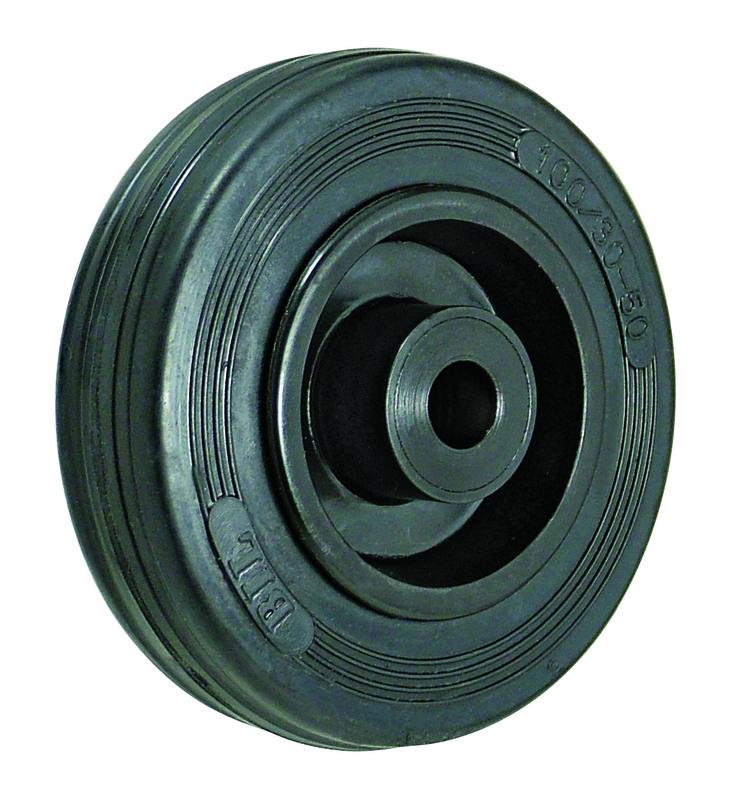 Black rubber wheel on a black nylon centre with a roller bearing. Wheel diameter 150mm, tread width 40mm, bore size 15mm, hub length 45mm. Load capacity 110kg. Black rubber tyre on black polypropylene centre with a plain bearing. Wheel diameter 160mm, Tread width 40mm, bore size 20mm, hub length 60mm, load capacity 140kg. 160mm black rubber tyre on red polypropylene centre with plain bearing. Tread width 40mm, Bore size 20mm, hub length 51mm. Load capacity 140kg. 160mm black rubber tyre on red polypropylene centre with plain bearing. Tread width 40mm, Bore size 25.4mm, hub length 51mm. Load capacity 140kg. Black rubber tyre on steel disc centre with a roller bearing. Diameter 125mm, tread width 37.5mm, bore size 15mm, hub length 45mm. Load capacity 90kg. Black rubber tyre on black polypropylene centre with a roller bearing. Wheel diameter 160mm, Tread width 40mm, bore size 20mm, hub length 60mm, load capacity 140kg. Black rubber tyre on white polypropylene centre with plain bearing. Diameter 125mm, tread width 35mm, bore size 12.7mm, hub length 38mm. Load capacity 30kg.Please advise if red or bkack cap required..
Black rubber tyre on white polypropylene centre with plain bearing. Diameter 180mm, tread width 43mm, bore size 12.7mm hub length 38mm. Load capacity 50kg.Please advise if red or bkack cap required..
200mm diameter black rubber tyred on a black poypropylene centre wheel with a plain bearing. Tread width 50mm bore 12mm hub 48mm Load capacity 205kg. Black rubber tyre on a black polypropylene centre wheel with a roller bearing. Wheel diameter 200mm, tread width 50mm, bore 20mm, hub width 60mm. Load capacity 205kg. 200mm diameter black rubber tyred on a black poypropylene centre wheel with a plain bearing. Tread width 50mm bore 20mm hub 60mm Load capacity 205kg. 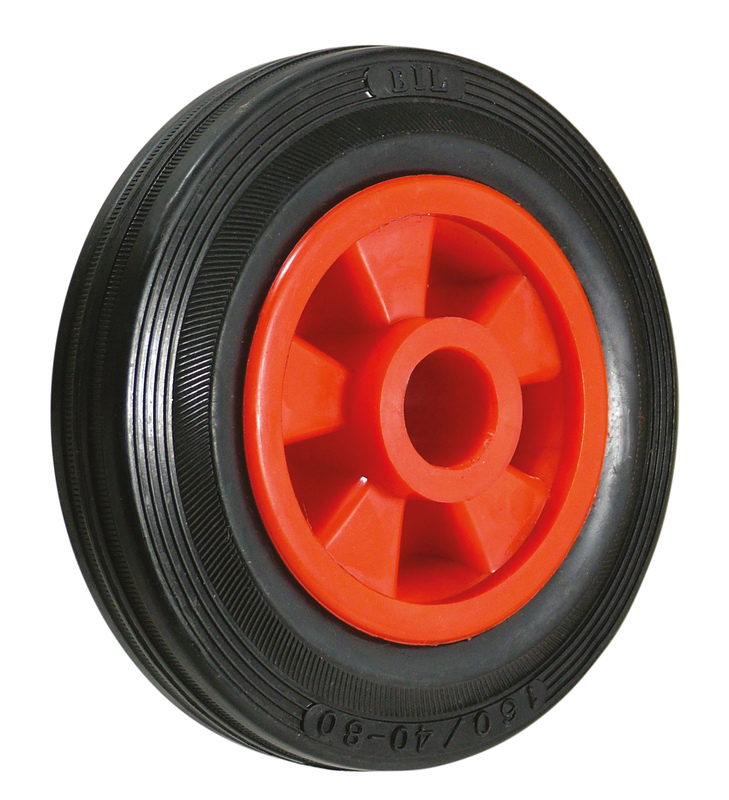 Black solid rubber tyred wheel, with a white polypropylene centre, 200mm wheel diameter, 43mm tread width, 12.7mm bore, 38mm hub width, with a load capacity of 50kgs.Please advise if red or black cap required..
180mm diameter black rubber tyred on a black poypropylene centre wheel with a plain bearing. Tread width 50mm bore 12mm hub 48mm Load capacity 185kg. 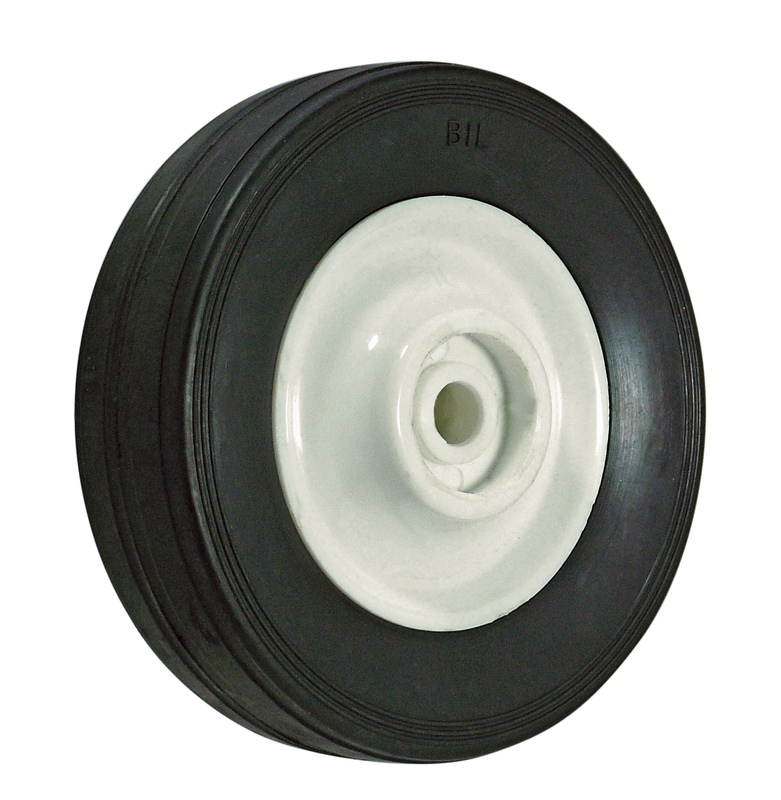 Black rubber tyre on white polypropylene centre with plain bearing. Diameter 150mm, tread width 35mm, bore size 12.7mm, hub length 38mm. Load capacity 30kg.Please advise if red or black cap required..